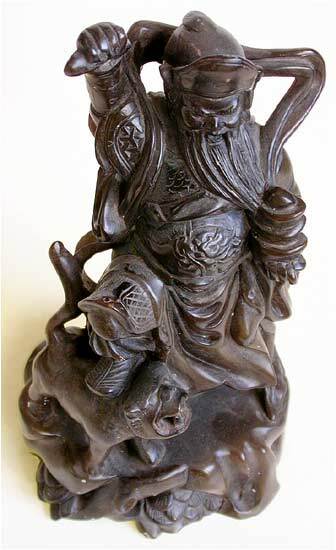 Tsai Sheng, the Star God of Affluence, his shrine is to be found in every home in China. 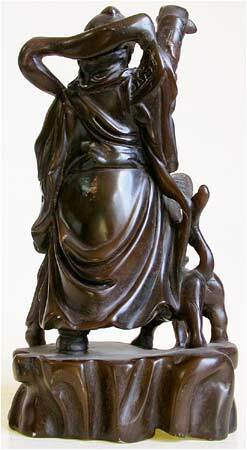 He is considered to be the sage Pi Kan of the 12th century B.C., who reproved the evil conducts of emperor Chou Hsin of the last Shang dynasty (16th century-1050 B.C. ), whereupon the emperor ordered the sage's heart cut out in order to prove if there were seven orifices, as commonly believed to be the case in the heart of great integrity. 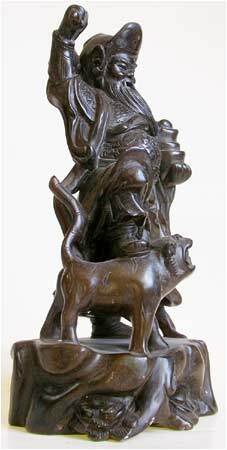 The Star God of Affluence and his Black Tiger motif is one of the most recurring themes in Chinese painting and sculpture. 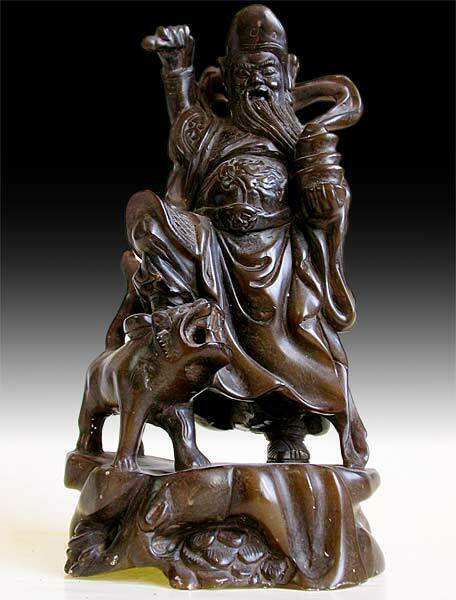 This brown jade carving of the God of Wealth evidently carved in acute perception, with energy emanating from this small statue. The jade carving is in excellent condition, but the sword has been missing. Since accurate dating of jade carving is nearly impossible without extensive scientific testing; therefore no specific date is attributed in this jade sculpture, and the Star God of Affluence is being sold with no claim to its antiquity.